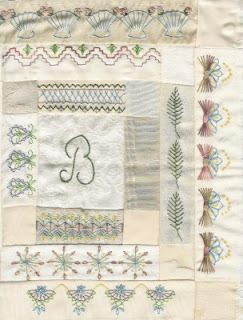 Many of you know that last year when Miss Carole came to Wichita to teach, she designed a brand new sampler just for us. 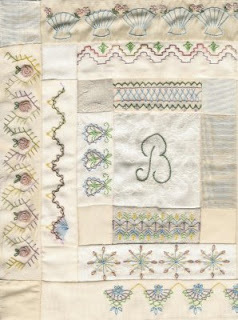 If you look at one of my older posts, you will see the earlier stages of my sampler. It is now about 90 per cent done and I am for the most part happy with it. It is certainly not without errors but that's okay...very hard for a perfectionist like me to say! I don't know...I might redo the snowflakes, they are much bigger than Miss Carole designed them to be..I just don't know what happened there. Now to explain many of the reasons that I have not posted for awhile. Early August I went to St. Louis on vacation. I will post later some pictures of a FANTASTIC Victorian house I went through. It always seems that crazy quilters also like to visit Victorian houses. They allowed pictures, so I will post at a later time. Now for something that was more exciting than my vacation, was an unexpected trip to Colorado this last weekend. Okay, for one thing, it was more exciting than vacation because being the mother of 4 boys the trip was essentially a BOY TRIP and I had one little meltdown about it and that is why I insisted on the above mentioned Victorian House. This last weekend I found out that Christine Dabbs was teaching in Loveland Colorado and I was not going to go but with the generous urging of two of my friends and a very generous offer of one friend to babysit, off I went. It was absolutely wonderful and I felt that God guided me through the whole trip and I knew that he wanted me there. Here is a picture of her holding one of her UFO's, she says will never be finished. Her work is fantastic, awesome...whatelse can I say. Okay, now for the unexpected bonus of the trip. The entire Hoffman Challenge entries were displayed and as I turned a corner...there was Betty Pillsbury's Peacock Wallhanging right there is front of me! So only did I get to see all of Christine's Dabbs many crazy quilts.. there is Betty's Wallhanging. It was wonderful. The reason I got so much done on my fancywork sampler is because I had alot of downtime and NO CHILDREN. I missed them but boy did I get alot done. Wow Val you've been one busy lady! Your sampler looks just great!! I'm glad you got the time away and had such a good time. Getting to see Betty's Wallhanging had to be such a thrill!! I like your snowflakes! Glad you got to go to Colorado without children.